Balanced the game and added a whole load of automated tests so It doesnt get de-balanced in the future. Now grass & other loded plants appear smoothly on the terrain. Added the ability to load simple mods into the game. Added a cap to the consecutive hits. Added a damage reduction stat, which scales with the level. You can write /hello to greet. Improved performance of UI rendering. Fixed a bug where items with the same seed would variate in stats. Added max mana & max health text info. Increase the model size of the bee. Increased the size of the blacksmith. Increased the damage of RMB abilities. Fixed the health bar of some mobs being placed under them. Fixed bosses getting damaged when spawning. Fixed gorilla growl not working. Fixed some far away chunks having a very high lod. Fixed the aspect ratio of the game. Fixed the whirlwind animation while walking. Fixed a bug where holes would appear in graveyards. Fixed a bug where structures would appear on the map but wouldnt spawn. Fixed a bug where the item image on the inventory would be far way from the mouse. Fixed a bug which would cause a lower LOD size. Fixed bandit camps tents not appearing. Fixed being able to look the terrain on very steep mountains. Fixed bosses sometimes not spawning. Fixed campfires spawning in villages. Fixed fog sometimes not adjusting correctly. Fixed sometimes the market spawning in the air. Fixed mobs going into the ocean and river. Fixed noise texture moving with the tree animations. 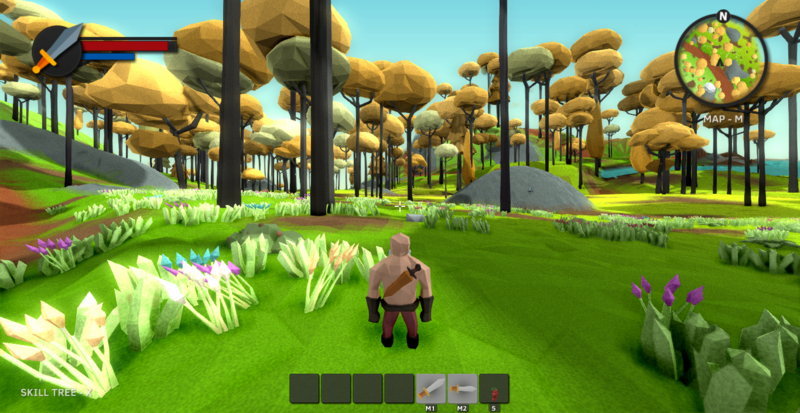 Fixed several "object" leaks and improved the overall performance when playing for a while. Fixed the map flickering when loading. Improved performance when having a lot of mobs. Improved the spawning of the bandit camp. Now whirlwind scales the time and damage. Now obelisks can replenish stamina. Reduced the falling damage penalty. Reduced the chance of spawning berries. Reduced significantly the game's size. Structures dont scale anymore with the player's level. Fixed "When standing on a hill or even on a flat land, looking down quickly-ish you can see under the map/ground for a couple of seconds". Fixed "Whirlwind cooldown goes negative".